FishFishFish Blog: Autumn is Here! Autumn is here so that means one thing to pond owners... Leaves! Leaves are a pain to keep out of your pond as they can clog up filters, break down and cause water quality issues and overall don't look very appealing all over your pond. One of the best way we have found to keep the leaves out of your pond is the new pond net pyramid from pond Xpert. This pond net has a fantastic 'pop-up' pyramid design to cover over ponds up to 3.5 x 6m. The design of this pond cover net means that leaves, twigs, acorns etc. just simply roll off the net rather than sitting on top of the net like most standard pond nets. The pyramid design also means that it does not crush the plants in your pond so they can remain healthy as well. 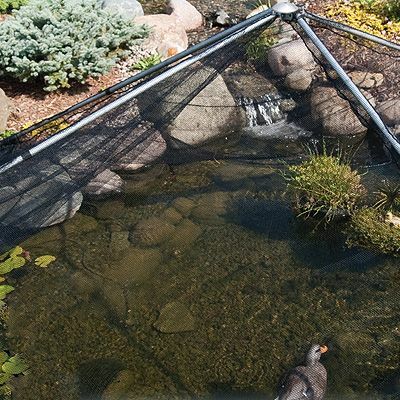 This pond net is also also heron proof so you do not have to worry about the pesky local heron attacking you pond fish. You can place this net on uneven ground and the mesh is already attached to the frame so there is really no setting up needed with this fantastic product. Keep your pond clearer and your fish safer with this unique pond net pyramid.